A lunar meteorite is an achondrite (a type of stony meteorite) that has come from the surface of the Moon. More than 40 lunar meteorites have been identified with a total mass of more than 30 kilograms. Most have been found in Antarctica and in the deserts of northern Africa and Oman, although one, a 19-gram specimen, was recovered in 1990 from Calcalong Creek, Australia. 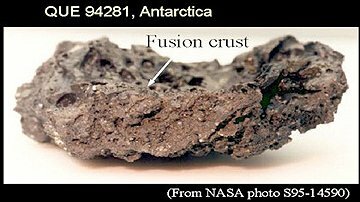 The first lunar meteorite, Yamato 791197, was discovered in 1979 in Antarctica, but its lunar origin was not appreciated for several years. The first meteorite to be recognized as originating from the Moon was Allan Hills 81005, which was found in 1982. The fact that these rocks came from the Moon has been established by comparing their mineralogy, chemical composition, and isotopic composition with those of the Apollo samples. The lunar meteorites are invaluable because, in many cases, they represent specimens of the Moon from regions not visited by the manned Apollo or unmanned Russian sample-return missions. All six of the Apollo missions on which samples were collected landed in the central nearside of the Moon, an area that has subsequently been shown to be geochemically anomalous by the Lunar Prospector mission. Lunar meteorites, in contrast, are random samples of the Moon and consequently provide a much more representative sampling of lunar surface and near-surface material. About half the lunar meteorites, for example, have probably come from the farside of the Moon. Most lunar meteorites were blasted from the Moon by impacts that made craters of a few kilometers in diameter or less. No source crater has been definitively identified for any of the rocks found to date, although it has been speculated that the highly anomalous lunar meteorite Sayh al Uhaymir 169 derives from the crater Lalande on the lunar nearside. Cosmic ray exposure history established with noble gas measurements have shown that all lunar meteorites were ejected from the Moon in the past 20 million years. Most left the Moon in the past 100,000 years. After leaving the Moon, most lunar meteoroids go into orbit around Earth and are eventually drawn in by Earth's gravity. Some meteoroids ejected from the Moon get launched into orbits around the sun. These meteoroids remain in space longer but eventually intersect the Earth's orbit and land. The lunar meteorites found so far have been divided into four groups: LUN A, LUN B, LUN G (for "gabbro"), and LUN N (for "norite"), representing distinct types of rock. Some of the specimens are especially interesting. A LUN B meteorite found in Morocco in 2000, for example, evidently crystallized from a molten state within the past 2.8 billion years, pointing to a surprisingly recent outbreak of volcanic activity on the Moon. The only known representative of group LUN N, found in three pieces near Dchira in the Western Sahara and named NWA 773, is very significant because it represents a type of rock never sampled by the Luna or Apollo landing missions, yet detected from orbit at several sites on the surface. A possible source of NWA 773 is the Aitken basin, a large impact structure near the lunar south pole that is well known for its noritic composition and secondary impact craters.